This tough, stylish, and utilitarian unit offers full access for changing the pan, and ventilation holes on its back ensure proper air circulation. 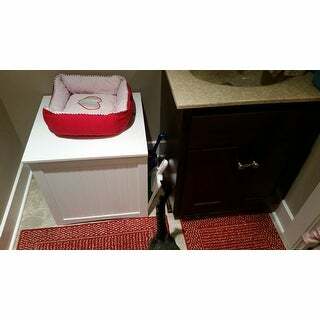 Ensure kitty's privacy while she does her business inside this litter box enclosure. This is the second one I have owned. I have two now because I have two cats and needed them in different rooms (bathroom and laundry room). They are easy to set up, although the directions are not fully clear or evident. One item is actually attached when it comes to another, so look for the knob to already attached to the screw versus two separate pieces. The unit is pretty sturdy and easy to open the door and retrieve the box in order to clean it. I do use Arm &amp; Hammer powder litter freshener with my unscented litter to ensure the box itself doesn't get too smelly being confined. My only negative is that I use those super large, high backed litter boxes. They do not fit in the enclosure UNLESS you do not add back panel. Which makes the entire unit a little wobbly, but I have been doing this with the older one, same company, same design for years and it hasn't broken. So that's just an FYI for anyone who uses the largest boxes. Mine sticks out the back a little in order to close the door. It's not a big deal. The top of the enclosure can hold cat stuff, or whatever. I have their brush etc on top in a basket. I personally think it's well worth the money. My new place has all parquet floors and before I got the second box, pieces of litter were lightly scattered everywhere all over the apartment, which was making me crazy, as I'd vacuum at least twice a day. Now, I get a few straggled pieces here and there that mainly stay in the bathroom. That's a win in my book. Overstock.com did a great job shipping this fast and it came undamaged. I cannot highly recommend this item enough. This arrived quickly and was pretty easy to put together. No tools needed, but it was a two person job (my mom and I knocked it out in about 30 minutes). It's not the most sturdy piece of furniture, but all it needs to do it sit in place, and it looks great, so for the price, it's a great value. I was worried that my cats wouldn't use it since there are 10 years old and have never had litter box furniture before. However they were in there within 10 minutes of me setting up and now prefer to use this one the most out of their three. Ordering another in the brown as soon as they're available again. 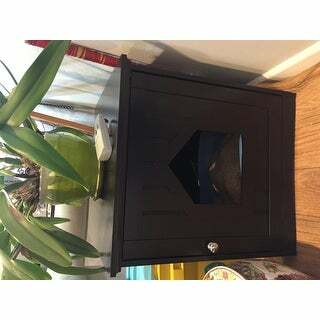 I am very pleasantly surprised with Trixie Wooden Cat House and Litter Box Enclosure. The most helpful feature for me, is great quality, good product, reasonably priced and service. Definitely, recommend one! Thank you for this product, it's awesome! The box definitely reduces litter spillage and is attractive on the outside. However, the floor inside (where the litter box sits) is deteriorating rapidly due to occasional drips when cats overshoot their mark. Paint is peeling and there are many bumps and dents. I've had to line the floor with vinyl and I've sanded and painted twice. Might have been ok if I'd known how delicate the floor material was and had started out taking these extra steps. I like the quality of the construction of the box, the design and the ease of putting it together. We had it assembled in about 20 minutes. It looks great in my office! The cats took to the box right away despite never having used a covered box. This is our second wooden cat house by Trixie. 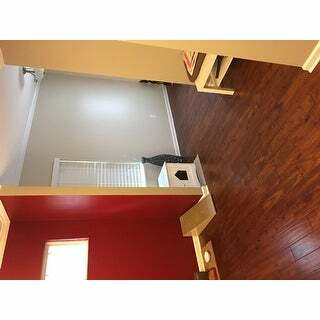 Both the white and walnut colors are excellent choices - based on what your needs are. My only issue with the the box is that is a bit difficult to find the right size litter box to fit inside. We would like to have a box with higher sides, but couldn't find one that would fit. Great litter box hideaway. My husband put it together very easily. It is in our guest bathroom, and you don't even notice it contains a litterbox. It looks so much better than just having a litter pan sitting out in the open. It works fine with smaller pans, but don't expect a big one to fit in it. fits under my counter and keeps most of the litter from being all over the floor. 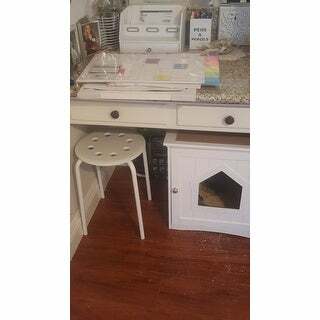 the cat house, the rug and litter box changed my kitchen from a kitty bathroom to a private room for my cat. Nice! Wish it came with a litter box that fit in it and the color was not white as I expected - it was a brown but it was still nice and still worked in the area I put it. Easy to put together and my kitties seem to like it. I am a very neat person and did not want a litter box sitting out anywhere.We had only one place to put it and I hated it.So I shopped.FInding this item was the answer. 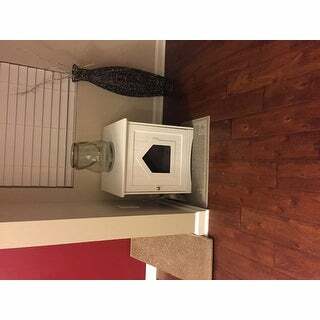 It keeps the litter box out of sight, kitty used it immediately and it deters the smell a bit as well.It fits under a shelf perfectly in my roomand looks like a piece of furniture.Less mess on the floor as the step up to the door keeps the litter inside. I think it could have also been used for a cute cat hideaway with a bed or blanket inside.But It was a priority for me to hideaway the litter box. My condo is small but I needed a place for my newly aquired cat. This not only hid the cat box but looks great! My husband put it together easily and our girl took right to it. It was a great purchase. This is such an excellent way to store a litterbox!! It contains the pieces of cat litter that get kicked out...hides the box, hides the smell, can serve as a cute plant table, whatever! Love it! This was easy to put together and very sturdy. Perfect for containing the dust of cat litter. Easy to put together. A little flimsy for the price.. needed to use my own tools and some extra hands. Only took about 20 minutes to finish. I love my cat cubby so much. I use it to keep all that cat litter mess off my floors. I couldn't be happier. My bathroom floor was always a mess. I want to thank overstock.com if I hadn't seen their ad I would still be stepping on cat litter, solid sturdy magic. Very nice looking. Bought one for my daughter’s cat as well. Instructions aren’t that helpful, but nice when finally assembled. It was not delivered as scheduled. Love the look. The litter box I also purchased on Overstock fits perfectly. Keeps the litter box hidden. Its not high quality furniture but for the price its a good deal. "does it come with a litter box"
"What are the internal dimensions of the box"
The Cat House will house a small litter box with short sides. High sided boxes will block the entry. "How high off the floor is the entry hole?" The entry hole is 7 inches from the ground. About 6” off the floor. It keeps the litter from scattering. "Does this fit the breeze litter system??" No This needs a small litter box. I can't even use mine. It's oretty. We put it together and I don't have a box small enough I guess I need to learn to measure before I buy! Unfortunately, the inside of this is rather small. 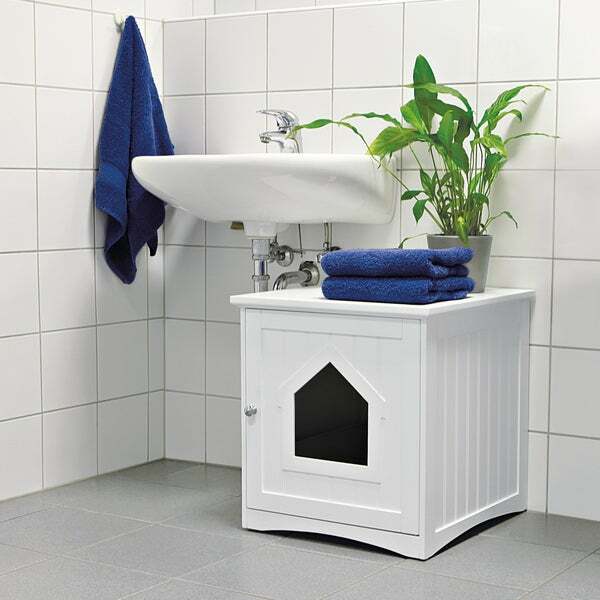 We couldn't even fit one of those high sided litter pans or a small enclosed litter box. We just ended up using it as a cat hideaway, lol. We put a fleece pet bed in there and they love sleeping in it. "Can the door be connected (either side) to open out to the left instead of the right as shown in the photo?" I don't think so. There are pre-drilled holes on the right-hand side that the wooden pegs sit in for the door to swing out right. If you have a drill and you are handy you might be able to make your own holes and then just attach the door closure on the opposite side. No . But you could drill the holes to make that possible. "Is the back of this white as well? As in, would I be able to turn it sideways away from the living room, or does the back not match the rest?" Mine is white on the back as well. "Is this ideal for a large cat? " My cat is about 10 pounds and it's fine for her. Just make sure that your litter box fits inside. We've had a hard time finding one that fits well. My 19lb boy cat, could not fit in it. he would climb in and could not turn around and ended up spraying outside the opening. My other 2 cats are smaller 10lbs each and they fit fine, and had no issues. Its a great product, just didn't work out for my Big Boy..
No. This was not sturdy and it feel apart. I was very disappointed in the design and the quality.